Point to a contact’s picture in Lync, Outlook, or another Microsoft Office application. Click the More Options button . You can also add contacts to your Favorites by clicking and dragging them in from other groups. 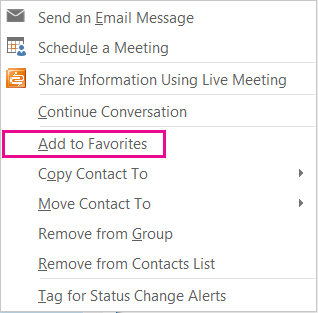 The Favorites group in Lync 2013 behaves exactly the same as “Frequent Contacts” in Lync 2010. Contacts that you have manually added to the group appear at the top of the group, and auto-suggested contacts appear at the bottom.